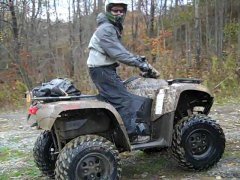 Posts about Arctic Cat atv models and manufacturer specific topics. 1999 arctic cat 250 2x4 brake light question. 2000 Arctic Cat 500 - Electrical Issue Maybe? 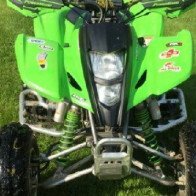 98 Arctic Cat 300 2x4 Carb Question??? 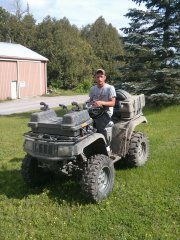 need opinion on proper size atv! So yesterday I pulled the side of the case to investigate the broken electric start. I struggled with the pull start cup but got that off, and then struggled with the stator for an hour and a half, but got that off, too. If you look before you can see I mentioned that supposedly the starter was bad? Yeah, that was a lie. It was actually the fact that the starter clutch bolts are broken. Explanation: The starter gear just slips into the starter clutch and free floats on the shaft. The starter clutch is anchored to the stator, which is keyed onto the shaft. When you hit the start button, the starter turns the starter gear, which engages the starter clutch and turns the motor. Basically that means that with my situation is when you hit the starter, it turns the clutch on the shaft, so it does engage but it doesn't engage the shaft. The clutch issue is an adjustment issue. My brother attempted to adjust it but forgot the second step of loosening it until you feel resistance again. He just tightened it all the way in and tightened the locking nut. One long term plan is to pull all the plastic off and repaint it. My brother repainted it in this awful green.